Why do they all go up? The better to beat you my dear! 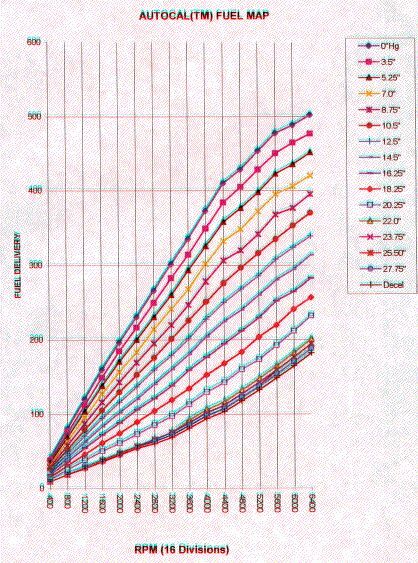 RSR Fuel Injection Systems are unique in the fact that all fuel maps are scaled not in milliseconds or some arbitrary number that equates to milliseconds, usually 16 to 255, but in actual fuel delivery. The bigger the number the more fuel delivered, it's that simple. This means as the rpm increases the numbers always get bigger and as the load increases the numbers always get bigger. This eliminates a bunch of problems because humans can't seem to get it through their heads that you don't always keep holding the injectors open longer and longer as the rpm and load increases. No need to go through a lengthy explanation here, suffice to say in our Autocal system if you have an entry of 500 and you want 10% more fuel you just enter 550. Nothing could be clearer. No damn milliseconds.